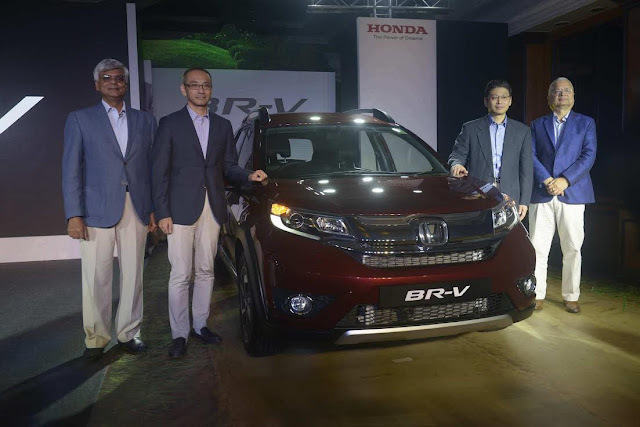 Mumbai, May 6, 2016: Honda Cars India Ltd. (HCIL), leading manufacturer of premium cars in India, today introduced its new model Honda BR-V. The BR-V (Bold Runabout Vehicle) boasts a Bold and Sporty Stance, Best in Class Ground Clearance, Powerful Performance, Excellent Mileage and Highly Versatile Premium Interior with 3-row configuration. In yet another segment first, the unique “Paddle Shift” option in the CVT variant provides the convenience of an automatic with enhanced driving pleasure of a manual and can be operated using the Sports Car inspired paddle switches located just behind the steering spoke. In line with HCIL’s Safety Direction in India, the BR-V comes equipped with Dual SRS Air Bags as Standard offering across variants, along with host of other active and passive safety features. The Honda BR-V features a host of advanced interior equipment including the Push Button Start with Smart Entry, Integrated Bluetooth Audio System with Hands Free Telephone (HFT) and Steering mounted controls for Audio, Automatic Air Conditioner and Power Foldable ORVMs to provide more convenience for the consumers. The Multi Information Display (MID) allows the driver to monitor all important trip and vehicle information including Driving Range, Instantaneous and Average Fuel Efficiency, Ambient Temperature and Time. Further, an Eco lamp provides feedback to the driver during fuel-efficient driving. The outstanding package of the BR-V is based on Honda’s Man Maximum Machine Minimum concept to create Maximum space for the occupants offering significantly high Headroom, Legroom and Knee room. At 4456 mm long, 1735 mm wide & 1666 mm tall with a wheelbase of 2662 mm, efficient use of space has been made to create an ultra-spacious cabin. The 2nd Row seat features a 60:40 Split with Slide and Recline option to enable customers adjust the space as per their convenience. The 3rd row seat is a 50:50 spilt folding type which can be reclined for extra comfort. Once fold flat, the 3rd row seat can be quickly and conveniently tumbled forward to maximize the cargo space. Thebase cargo area for BR-V is a generous 223 L which can be enhanced to 691 L in the 3rd row fold configuration. Entry and exit for the third row is very convenient due to the one-touch tumble second-row seat. In addition, BR-V hasAdjustable Headrests on all 3 rows. The Roof Mounted Rear Air Conditioner is positioned between the first and second row seats to optimize the air flow in all areas, ensuring maximum comfort for all passengers, no matter where they are seated.The Minimum Turning Radius of 5.3 m (petrol) and 5.5 m (Diesel) makes the BR-V highly maneuverable and convenient for city driving. Customers can be confident in the BR-V even when facing bad roads and stormy weather owing to its Best in class ground clearance 0f 210 mm. The BR-V chassis realizes both superior ride comfort and smooth & agile handling. For a better crash performance and more comfortable ride of the All-new BR-V, body rigidity and damper have been newly developed for a Compact SUV driving feel.The car features a McPherson Strut suspension in the front and Torsion beam rear suspension, which dramatically improves driving stability and ride comfort. The Electric Power Steering aids the driver to steer the car with less effort and gives better handling. Honda BR-V embraces a comprehensive approach to vehicle safety that provides a high level of both active and passive occupant protection. The BR-V’s Advanced Compatibility Engineering™ (ACE™) body enhances self-protection while mitigating damage to other vehicles in the event of a collision. The high-performance body makes extensive use of high tensile steel in key areas of the frame to enhance safety and collision force absorption. The Honda BR-V comes loaded withactive and passive safety technologies including Front Dual SRS airbags as Standard Offering on all grades, Anti-Lock Brake System (ABS) which prevents wheel lock during sudden braking; Electronic Brake Distribution (EBD) which enhances braking performance; Pretentioner seat belts with load limiters. The ABS with EBD is being offered as standard across all Diesel variants.